St. Peter in Chains Cathedral has been located in Cincinnati since the early years of Ohio statehood. As the population of the city and the state grew in the first decades of the nineteenth century, the original cathedral was not large enough. The Roman Catholic population in the region grew significantly, especially as German immigrants moved to the region. In 1840, Bishop John Purcell purchased the land to build a new, much larger, building. Construction of the cathedral began in 1841 and was completed in 1845. 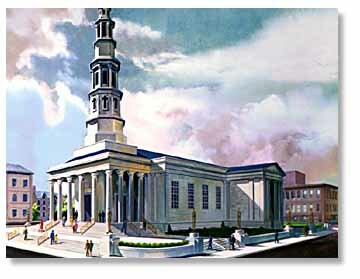 Architect Henry Walter designed the new cathedral, utilizing elements from classical Greek architecture in its design. At the time, St. Peter in Chains was the tallest building in the city. As Cincinnati continued to grow and change over time, the Cathedral's location proved to be detrimental. By the 1930s, few of the parish's members still lived near the church, and the neighborhood surrounding it had deteriorated. Archbishop John T. McNichols moved the diocese headquarters to Fairview, abandoning the old cathedral in 1938. This change only lasted until 1950, when Archbishop Karl J. Alter decided to return to St. Peter in Chains. Alter recognized that city leaders wanted to revitalize the downtown, and determined that a restored and enlarged cathedral could be an important part of the renovations. Work was completed by 1957, with the rededication ceremony taking place on November 3, 1957. Because of Cincinnati's prominence in the West in the nineteenth century and the diocese's continued leadership in the twentieth century, St. Peter in Chains Cathedral has hosted the ordination of many bishops, priests, and deacons.